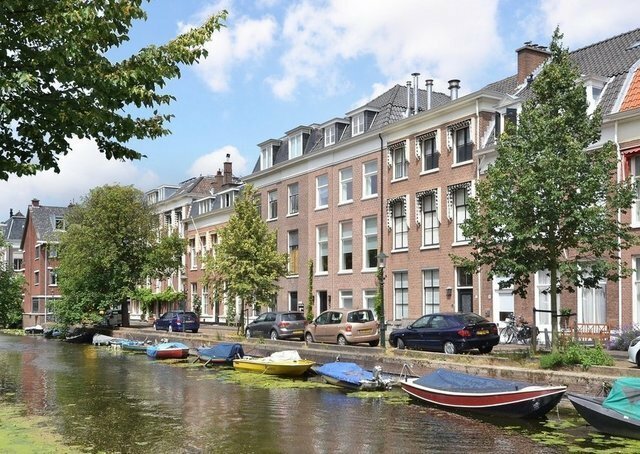 On an absolute top location in The Hague, Netherlands at the popular Buurtschap 2005 neighbourhood near the Denneweg and prestigious Hotel des Indes. A fantastic completely renovated house along the canal. Approximately 380m2 of living space. At the back a double garage with an independent apartment on top of it. This house is located in the vicinity of the Lange Voorhout, the Royal Theater and the center of The Hague. Good connections to public transport, among others the tramways to the Central station and Scheveningen. entrance with beautiful new granite floor, built-in wardrobes and brushed bronze doors to the hallway. Front / study with built-in cupboards. Laundry room, guest toilet, kitchenette with all appliances and access to the backyard from where the garage can be reached. Guest room with fitted wardrobes and bathroom with bath, shower, sink and toilet. This room has patio doors and overlooks the back garden. landing with luxurious toilet with fountain, beautiful front room with three windows overlooking the canal, fireplace with beautiful marble mantelpiece, impressive ornamented ceilings, dining room with open connection to the kitchen with all appliances, high quality counter tops and copper sink. Kitchen has a view over the backyard. landing, storage under the stairs, built-in laundry with laundry shoot, front bedroom with fitted wardrobes ensuite with a bathroom with sink, toilet and walk-in shower, master bedroom with built-in wardrobes and a walk-in closet between the two rooms, bathroom with washbasin , toilet, walk-in shower and freestanding bath. landing with built-in cupboards on all walls, sliding door to a bedroom with doors to large balcony, bathroom with walk-in shower, washbasin and toilet, bedroom at the front. Garage accessible from the Laan van Roos and Doorn. This garage has two charging points for electric cars and an electrically operated door. Access to the upstairs apartment, stairs to 1st floor, wide open space with kitchen, bedroom, bathroom with washing machine connection, toilet, sink and walk-in shower. This apartment is completely independent, has its own meters and boiler. bathrooms, kitchens, etc. Exterior new joints, newly built garage with upstairs apartment.